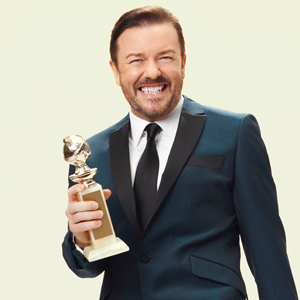 Ricky Gervais is coming back to host the Golden Globes on Sunday. This was shocking to many when the announcement was first made late last year. After the verbal hatchets he was throwing at every star in attendance at last years Globes we all thought that was the end of Ricky. He also said he would never do it again...but I guess everyone has a price, or a giant stipulation, that if agreed to, would entice a fellow to go back on his 'say no' determination. So Gervais will be back on Sunday. I am quite excited actually. Last year I was not loving his tactics, but now that we know more of what to expect I think it will be less awkward and more entertaining. I am especially thrilled because Gervais said on Twitter, "No one knows what I'm going to say until I say it. That was my only stipulation to host again." So he is a loose canon without a censor. Gawd, this is going to be a glorious disaster. I may even need to have a Golden Globe party to showcase the event.